I was rummaging around in my daughter's drawers the other day and discovered that her wool Finch shorts (from back here) had resized themselves to about right for an 18" doll. I had the pattern traced off in her size, so why not make another pair? Have I mentioned already how I'm on a kick to use up small bits of fabric and leave nothing behind? Yes, I know I have, but I'm serious about it and so I set to, trying to get the shorts to fit on the remnants of this retro floral fabric (used here). I barely made it. The cuff facings on the insides of the legs is a spotted cotton but since it never shows that was an ok cheat. 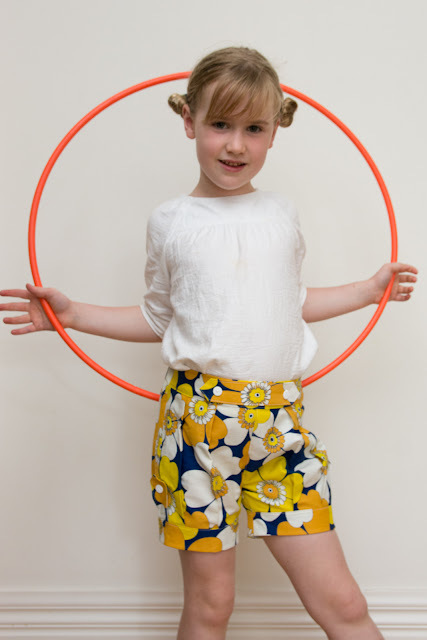 I'm yet to make the little top that goes with these shorts but I know A would love it. 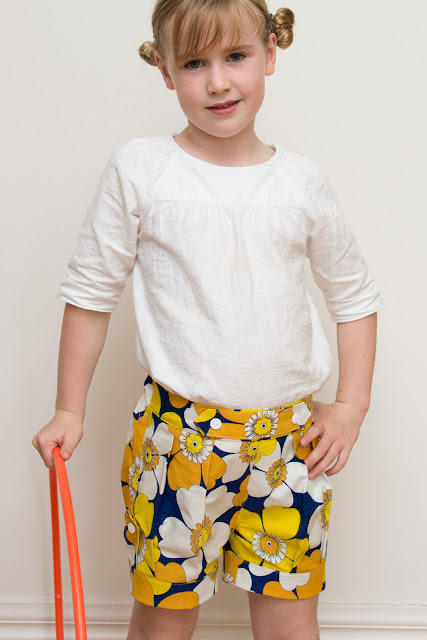 The shorts are a great pattern, such a cute shape and a delight to sew. Today had a distinct chill in the air and I'm starting to get excited about Autumn sewing. Yet we're off to the beach after Easter so I've been plunging back into the second chapter of the Summer Swimwear Sewathon. I love winter dressing but I'm enjoying the summer sewing too much to stop. I even busted out that Badminton top pattern and ticked it off my list from the last blog post. Fabric: Vintage cotton from my friend's mum's cleanout. Cannot tell you how much I freaking love these. So flipping gorgeous, Miss A is rocking them. What a great use for this bold fabric! So fun and unexpected! And look at you, frugally using up the very last scraps of this! Thanks Inder. I am really keen to get rid of all those little bits before everyone outgrows them. Blow the matching outfits risk, I'm on a mission! Gorgeous shorts. And well done in cutting a whole garment from leftovers. 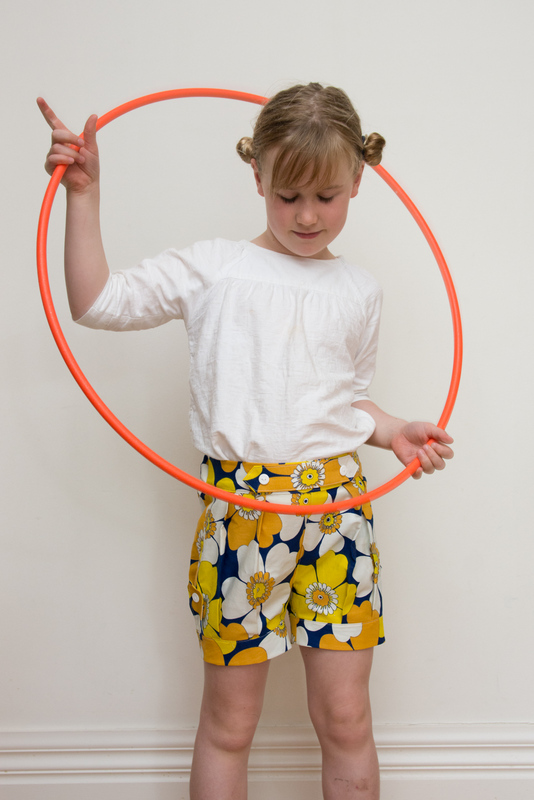 I love the bright happy fabric - perfect for summer shorts. And a great pattern too. I hadn't seen it before and a tempted to get it for my A! It's a lovely pattern. They're very nicely presented and well written. When I checked my link I noticed all the patterns were 40% off. Go for it!! Fantastic shorts and love the bright summer colours. Well done on using up all the fabric, and great save with the placket. Thanks Sharon. It seems silly to keep those tiny bits along with the bigger pieces but sometimes that's what makes the difference!